Have regard, O Almighty God, to our weakness, and as we sink under the weight of our own doings, let the glorious intercession of blessed Timothy, thy Martyr and Bishop, be a protection to us. Through our Lord Jesus Christ, thy Son, who liveth and reigneth with thee, in the unity of the Holy Ghost, God, world without end. Amen. Before giving thanks to God for the miraculous Conversion of the Apostle of the Gentiles [St. Paul], the Church assembles us together for the Feast of his favourite Disciple. Timothy—the indefatigable companion of St. Paul—the friend to whom the great Apostle, a few days before shedding his blood for Christ, wrote his last Epistle—comes now to await his master's arrival at the Crib of the Emmanuel. He there meets John the Beloved Disciple, together with whom he bore the anxieties attendant on the government of the Church of Ephesus; Stephen, too, and the other Martyrs, welcome him, for he, also, bears a Martyr's palm in his hand. He presents to the august Mother of the Divine Babe the respectful homage of the Church of Ephesus, which Mary had sanctified by her presence, and which shares with the Church of Jerusalem the honour of having had Her as one of its number, who was not only, like the Apostles, the witness, but moreover, in her quality of Mother of God, the ineffable instrument of the salvation of mankind. Let us now read, in the Office of the Church, the abridged account of the actions of this zealous disciple of the Apostles. Timothy was born at Lystra, in Lycaonia. His father was a Gentile, and his mother a Jewess. When the Apostle Paul came into those parts, Timothy was a follower of the christian religion. The Apostle had heard much of his holy life, and was thereby induced to take him as the companion of his travels: but, on account of the Jews, who had become converts to the faith of Christ, and were aware that the father of Timothy was a Gentile, he administered to him the rite of circumcision. As soon as they arrived at Ephesus, the Apostle ordained him Bishop of that Church. The Apostle addressed two of his Epistles to him—one from Laodicea, the other from Rome—to instruct him how to discharge his pastoral office. He could not endure to see sacrifice, which is due to God alone, offered to the idols of devils; and finding that the people of Ephesus were offering victims to Diana, on her festival, he strove to make them desist from their impious rites. But they, turning upon him, stoned him. The Christians could not deliver him from their hands, till he was more dead than alive. They carried him to a mountain not far from the town, and there, on the ninth of the Calends of February (January 24), he slept in the Lord. St. Timothy, the beloved disciple of St. Paul, was of Lycaonia, and probably of the city Lystra. His father was a Gentile, but his mother Eunice a Jewess. She, with Lois his grandmother, embraced the Christian religion, and St. Paul commends their faith. Timothy had made the holy scriptures his study from his infancy (II Tim, iii. 15). When St. Paul preached in Lycaonia, in the year 51, the brethren of Iconium and Lystra gave him so advantageous a character of the young man, that the apostle, being deprived of St. Barnaby, took him for the companion of his labors, but first circumcised him at Lystra. For though the Jewish ceremonies ceased to be obligatory from the death of Christ, it was still lawful to use them (but not as of precept and obligation) till about the time of the destruction of Jerusalem with the temple, that the synagogue might be buried with honor. Therefore St. Paul refused to circumcise Titus, born of Gentile parents, to assert the liberty of the gospel, and to condemn those who erroneously affirmed circumcision to be still of precept in the New Law. On the other side, he circumcised Timothy, born of a Jewess, by that condescension to render him the more acceptable to the Jews, and to make it appear that himself was no enemy to their law. St. Chrysostom here admires the prudence, steadiness, and charity of St. Paul; and we may add, the voluntary obedience of the disciple. St. Austin extols his zeal and disinterestedness in immediately forsaking his country, his house, and his parents, to follow this apostle, to share in his poverty and sufferings. After he was circumcised, St. Paul, by the imposition of hands, committed to him the ministry of preaching, his rare virtue making ample amends for his want of age. From that time the apostle regarded him not only as his disciple and most dear son, but as his brother, and the companion of his labors (I Thess, iii. 2; I Cor, iv. 17). He calls him a man of God (I Tim, vi. 11), and tells the Philippians, that he found no one so truly united to him in heart and sentiments, as Timothy (Phil, ii. 20). This esteem of the apostle is a sufficient testimony of the extraordinary merit of the disciple, whose vocation and entrance into the ministry was accompanied with prophecies in his behalf (I Tim, i. 18). St. Paul travelled from Lystra over the rest of Asia, sailed into Macedon, and preached at Philippi, Thessalonica, and Berœa, in the year 52. Being compelled to quit this last city by the fury of the Jews, he left Timothy behind him, to confirm the new converts there. 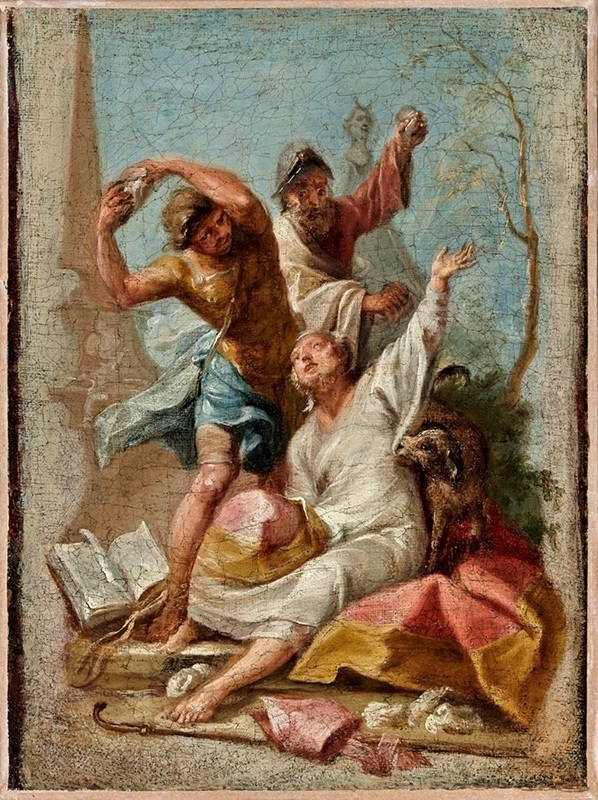 On St. Paul's arrival at Athens he sent for him, but being informed that the Christians of Thessalonica lay under a very heavy persecution for the faith, he soon after deputed him to go thither, to comfort and encourage them under it; and he returned to St. Paul, then at Corinth, to give him an account of his success in that commission (Acts, xviii). Upon this the apostle wrote his first epistle to the Thessalonians. From Corinth St. Paul went to Jerusalem, and thence to Ephesus, where he spent two years. Here he formed a resolution of returning into Greece, and sent Timothy and Erastus before him through Macedon, to apprize the faithful in those parts of his intention, and to prepare the alms intended to be sent the Christians of Jerusalem. Timothy had a particular order to go afterwards to Corinth, to correct certain abuses, and to revive in the minds of the faithful there the doctrine which the apostle had taught them; who, writing soon after to the Corinthians, earnestly recommended this disciple to them (I Cor, xvi. 10). St. Paul waited in Asia for his return, and then went with him into Macedon and Achaia. St. Timothy left him at Philippi, but rejoined him at Troas. The apostle on his return to Palestine was imprisoned, and after two years custody at Cӕsarea, was sent to Rome. Timothy seems to have been with him all or most of this time, and is named by him in the titles of his epistles to Philemon, and to the Philippians and Thessalonians, in the years 61 and 62. St. Timothy himself suffered imprisonment for Christ, and gloriously confessed his name, in the presence of many witnesses; but was set at liberty (Heb, xiii. 23). He was ordained bishop by a prophecy, and a particular order of the Holy Ghost (I Tim, iv. 14). He received by this imposition of hands, not only the grace of the sacrament, and the authority to govern the church, but also the power of miracles, and the other exterior gifts of the Holy Ghost. St. Paul being returned from Rome into the East, in the year 64, left St. Timothy at Ephesus, to govern that church, to oppose false teachers, and to ordain priests, deacons, and even bishops (I Tim, i). For St. Chrysostom and other fathers observe, that he committed to him the care of all the churches of Asia: and St. Timothy is always named the first bishop of Ephesus. St. Paul wrote his first epistle to Timothy from Macedon, in 64; and his second, in 65, from Rome, while there in chains, to press him to come to Rome, that he might see him again before he died. It is an effusion of his heart, full of tenderness towards this his dearest son. In it he encourages him, endeavors to renew and stir up in his soul that spirit of intrepidity, and that fire of the Holy Ghost, with which he was filled at his ordination; gives him instructions concerning the heretics of that time, and adds a lively description of such as would afterwards arise (II Tim, iii. 1, 2). We learn (I Tim, v. 23) that St. Timothy drank only water: but his austerities having prejudiced his health, on account of his weak stomach and frequent infirmities, St. Paul ordered him to use a little wine. The fathers observe that he only says a little, even in that necessity, because the flesh is to be kept weak, that the spirit may be vigorous and strong. St. Timothy was then young: perhaps about forty. It is not improbable that he went to Rome to confer with his master. In the year 64 he was made by St. Paul bishop of Ephesus, before St. John arrived there, who resided also in that city as an apostle, and exercising a general inspection over all the churches of Asia. St. Timothy is styled a martyr in the ancient martyrologies. His acts, in some copies ascribed to the famous Polycrates, bishop of Ephesus, but which seem to have been written at Ephesus, in the fifth or sixth age, and abridged by Photius, relate, that under the emperor Nerva, in the year 97, St. John being still in the isle of Patmos, St. Timothy was slain with stones and clubs by the heathens, while he was endeavoring to oppose their idolatrous ceremonies on one of their festivals called Catagogia, kept on the 22nd of January, on which the idolaters walked in troops, everyone carrying in one hand an idol, and in the other a club. St. Paulinus, Theodorus Lector, and Philostorgius, inform us, that his relics were with great pomp translated to Constantinople in the year 356, in the reign of Constantius. St. Paulinus witnesses, that the least portion of them wrought many miracles wherever they were distributed. These precious remains, with those of St. Andrew and St. Luke, were deposited under the altar, in the church of the apostles in that city, where the devils, by their howlings, testified how much they felt their presence, says St. Jerom; which St. Chrysostom also confirms. Pious reading was the means by which St. Timothy, encouraged by the example and exhortations of his virtuous grandmother and mother, imbibed in his tender years, and nourished during the whole course of his life, the most fervent spirit of religion and all virtues; and his ardor for holy reading and meditation is commended by St. Paul, as the proof of his devotion and earnest desire of advancing in divine charity. When this saint was wholly taken up in the most laborious and holy functions of the apostolic ministry, that great apostle strongly recommends to him always to be assiduous in the same practice (I Tim, iv. 7 & 13), and in all exercises of devotion. A minister of the gospel who neglects regular exercises of retirement, especially self-examination, reading, meditation, and private devotion, forgets his first and most essential duty, the care he owes to his own soul. Neither can he hope to kindle the fire of charity in others, if he suffer it to be extinguished in his own breast. These exercises are also indispensably necessary in a certain degree, in all states and circumstances of life; nor is it possible for a Christian otherwise to maintain a spirit of true piety, which ought to animate the whole body of all his actions, and without which even spiritual functions want as it were their soul.